Meatloaf! And oh my goodness was it tasty. I would have like to follow mom’s recipe, but I thought I’d create my own. 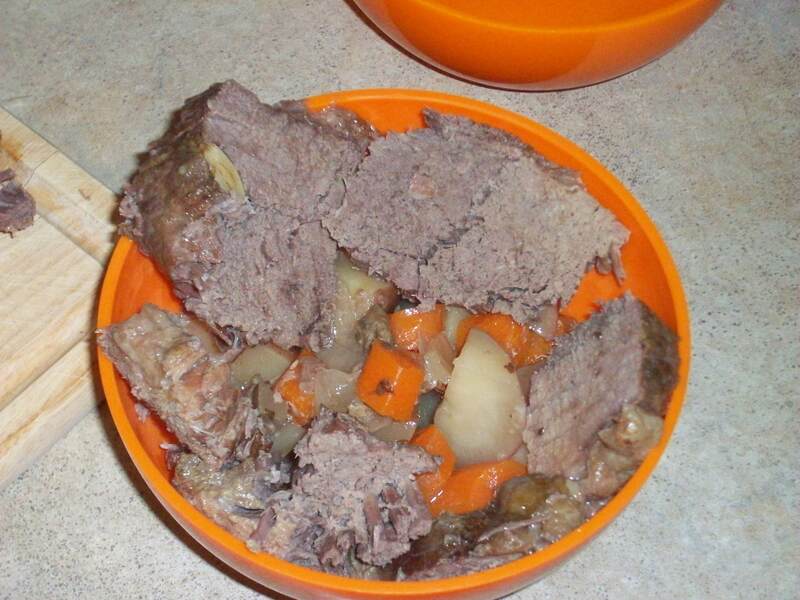 I have found that there are enough variations of meatloaf out there that they kind of become a family tradition of how they’re made. So I thought I’d start my own tradition. Unfortunately, this particular recipe from my noggin didn’t quite make the cut. It needs some tweaking. It almost tastes like it’s missing something. Couldn’t figure out what though. I’m not going to post the recipe, because it’s not mastered yet. I foresee a lot of meatloaf in our future. I may even try making meatloaf bites so I can make lots of different variations! But here’s what I did anyway: I mixed ground turkey with bread crumbs and an egg. That’s the base. I added minced garlic and diced onion. Although my onion wasn’t small enough. I think also, I might try cooking up the onion and garlic to release the flavor just a little bit. I added in some green bell pepper, minced nice and small. Then lets see…in went some parsley and oregano, about a teaspoon or two of both. Two teaspoons of horseradish, a couple splashes of Worcestershire, a splash of lemon juice, a teaspoon of dried ground mustard. And then I put ketchup, bread crumbs and Parmesan on top before putting it in a 350 degree oven for 45 minutes. What’s really cool is that it was perfectly cooked. Not too crispy and not pink at all. 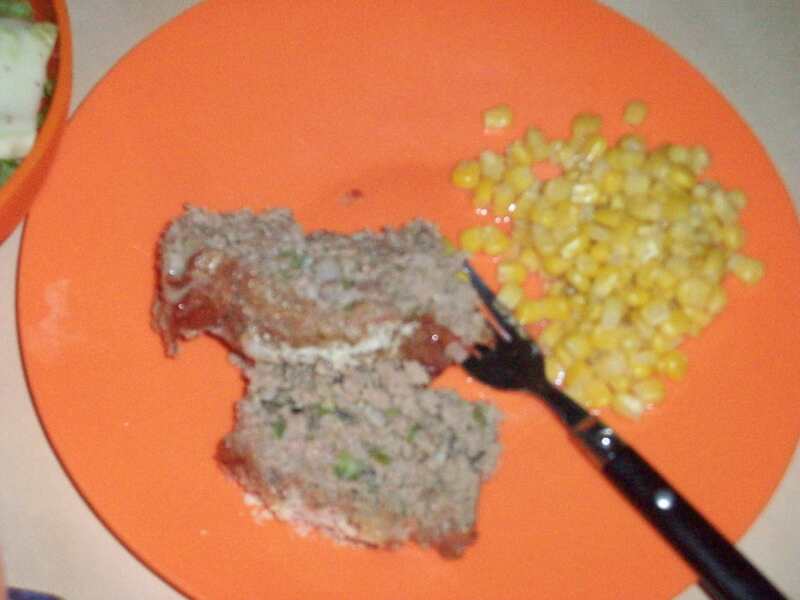 Meatloaf with corn. Also served a salad on the side. Anyone have any suggestions for additions? The roomie bought eggplant, because we both love it…but then I had to find something to do with it. Amazingly, she got a cookbook for christmas last year that is all eggplant recipes. One of them was this roasted medley that included most ingredients I already had. Easy! But since I didn’t have them all, I improvised a bit. Basically, what ended up going in there was cubed eggplant, chopped red potatoes, diced onions, chopped bell pepper, and chopped tomatoes. The recipe called for roasted peppers, but the fresh worked well. It also said to use a good baking potato, but I like the flavor of the red potato better. I think the baking potato would have been too bland. Over the top, it was olive oil and a whole host of spices to include oregano, rosemary, basil, thyme and sage. A little bit of lemon zest would have been really good, had I had a lemon, it would have complimented the thyme. All of this in a casserole dish got thrown in 425 degree oven for about 15 minutes or so, and it turned out to be one of those recipes that your nose will let you know when it’s ready. 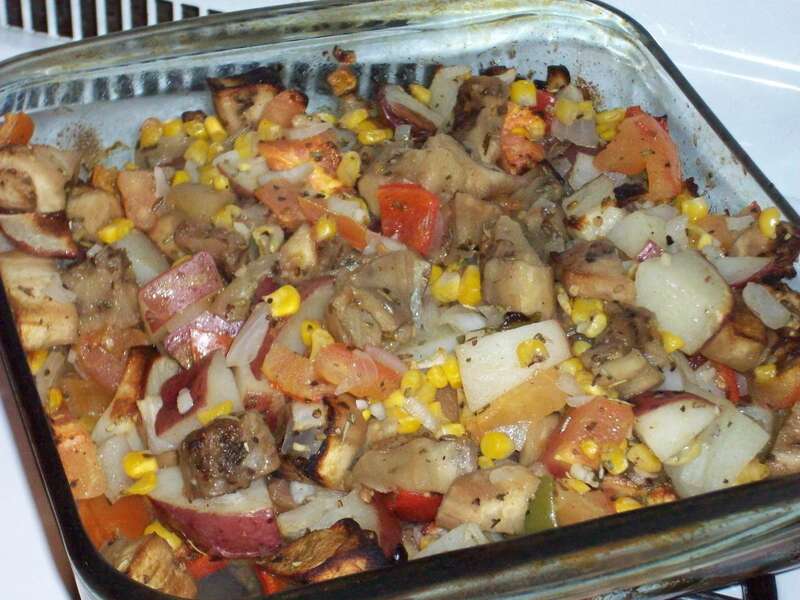 Overall, these roasted veggies work really well as a side for steak, and they’re really healthy because its all fresh ingredients. This was right after the veggies came out of the oven, they had softened up and the herbs worked their way through to infuse flavors. I gave the boyfriend the equivalent of a Food Network Challenge, and told him he had pork chops, balsamic vinegar, tomatoes and seedless green grapes. The idea was that I wanted to make pork chops, but I didn’t want to do it the same way that I always do. His solution was to make a grape balsamic marinade for the porkchops. 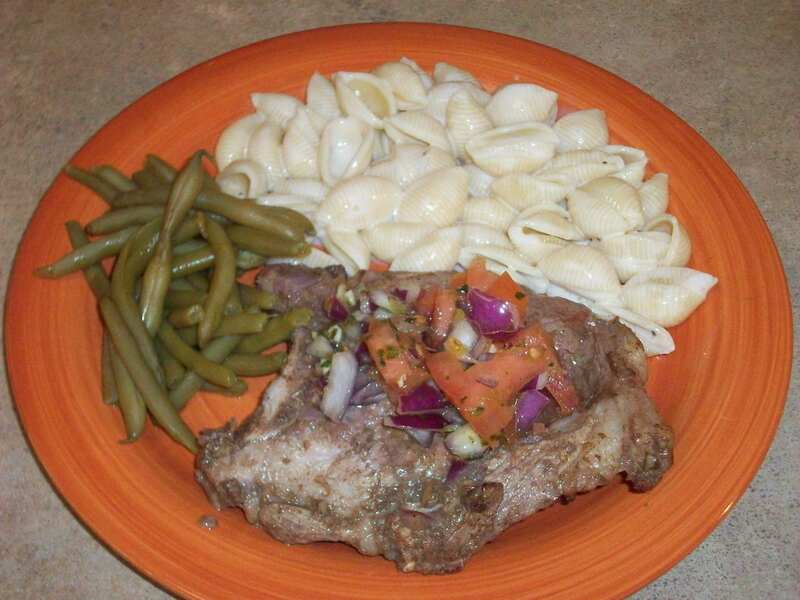 My balsamic pork chops with alfredo pasta and green beans. Thanks boyfriend! He’s very good at adding a “sneaky spice” as he likes to call it, and he suggested adding cayenne pepper and oregano to the glaze. Overall, the glaze had a slightly spicy, smoky, and very gently sweet flavor to it. It was really very good. So I added it into the bag that my pork chops were in and threw it in the fridge overnight. Tonight, I put those in a pan on medium high heat with the marinade, and some red onions and garlic (about half a clove minced). I let those cook about 2.5 minutes on each side then put them in the oven at 400 degrees for about 10 minutes with a splash of balsamic and some diced tomatoes. Final result? 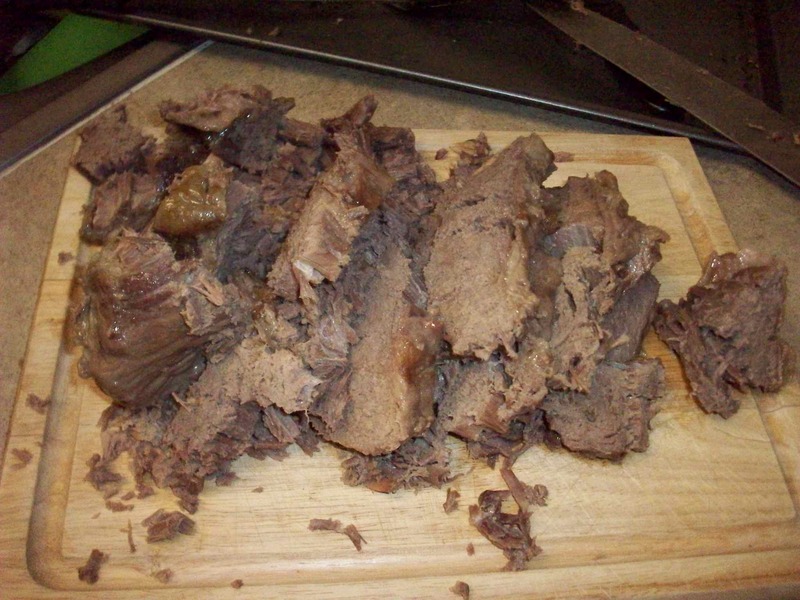 The marinade wasn’t strong enough to come through well in the flavor of the meat. But it did change the flavor from just that of basic pork chops. I think in future endeavors I would make the marinade stronger than I think it should be so that the flavor comes through well in the meat. I also made a sort of pico de gallo with tomatoes, red onions, cilantro and garlic to go on top. On the side, I used up some alfredo sauce on some pasta and made green beans for my veggie. So I promised a post about the spaghetti that I made a couple nights ago…unfortunately I’m only getting to it now! And of course I don’t have the card with the pictures on it, so those will have to be added later. I thought I was going to have three extra people besides me and the roomie, but I got canceled on by two of them – therefore I had too much food. But it was definitely scrumptious. 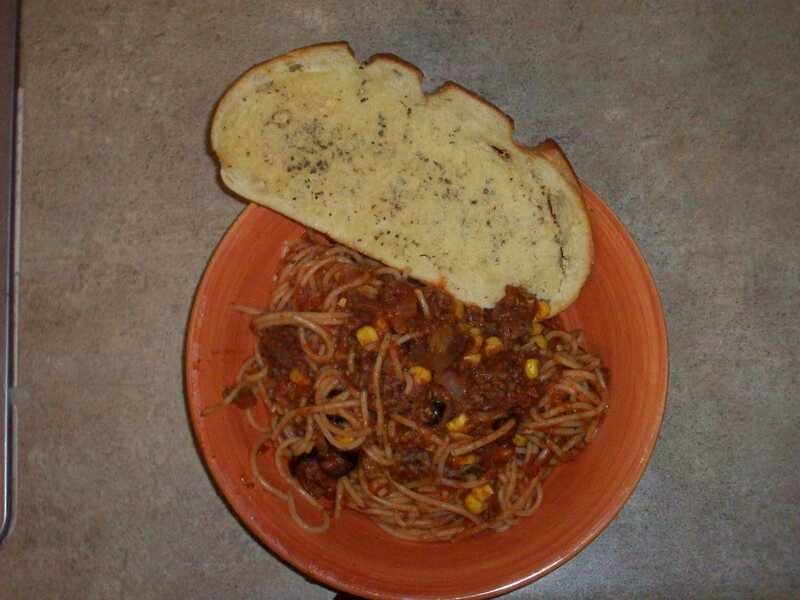 My spaghetti with tasty garlic bread. I’ve found that I’ve pretty much got mom’s recipe memorized, because once I looked at it to make sure I had all the ingredients, I didn’t look at it again. It was somewhat miraculous that I actually had the spaghetti spice mix. It was hiding with the rest of the spices in the bags in the cupboard. So the process for spaghetti is pretty easy actually. You need spaghetti, obviously, so go ahead and get the water boiling on that. When it’s boiling, add in your olive oil (twice around the pot), and a palmful of sea salt. The olive oil keeps the pasta from sticking together, and the salt flavors it. This is really the only chance to flavor the pasta itself, before you mix all the other ingredients with it. At the same time, get your ground beef going, let it brown, add the tomato sauce, tomato paste, and water, let it simmer, add the seasoning, the mushrooms, olives and corn, and let the flavors combine. Once it’s good and bubbly, drain the pasta and mix it all together. Some people like to put the meat and sauce on top of the pasta rather than mix it all together, but I like it together. It’s going to end up that way anyway. Make some garlic bread to go with it (I have a recipe for that), and serve it up with some parmesan on top…and you’ve got a filling and scrumptious comfort meal that can feed a crowd. So…this turned out to be a bit trickier than I originally anticipated. I feel like I am missing some key ingredient in my hummus. It just seems…blah? I added in the tahini, (which by the way is ground up sesame seeds, for those of you that didn’t know like me,) the garbanzo beans and garlic, with the water, oil and lemon juice, salt and pepper. It just didn’t have any flavor. I’m slightly disappointed. I’m going to experiment with the mass amount that two 15-oz cans made and see if maybe I can’t make it taste just a little more delightful. Either way. For the first time making hummus, besides my blender having a fit, it went rather smoothly.